Try these six diet tips to make small, meaningful changes in your life. There are a handful of easy to implement diet tips for better health and lasting weight-loss success that you can start following today. Every day another diet book hits the shelves, and new diet tips or a food fad populates social media. And with that, more and more people become confused about how they should revamp their eating habits to reach their desired health or weight goal. Should you go Paleo or vegan? Should you be eating coconut oil by the spoonful or spiking your smoothie with superfood powder? Making diet changes can be a challenge, especially if you’re cutting out a number of foods. But what often gets overlooked in the diet du jour hoopla is that data shows just making small changes in eating habits, such as realistic reductions in calorie intake, are enough to bring about meaningful improvements in health measures, like body weight. Here are a handful of easy to implement diet tips for better health and lasting weight-loss success. #3 Drink, then Eat. Water might be the perfect no-fuss appetizer. A study in the Obesity found that adults who guzzled 2 cups of water 30 minutes before their main meals lost more weight (about 3 pounds) over a 3-month period than those who did not preload their meals with water. Other research shows drinking more water each day (1-3 cups) can be an effective strategy towards eating fewer calories. “If you drink water before a meal, you begin to feel full before you sit down to eat, so you’ll wind up eating less and taking in fewer calories,” explains Cassetty. Drinking more water throughout the day also prevents dehydration which your body may mistake as hunger. #4 Fill up on Fiber. Adding an extra serving or two of high-fiber food to your daily diet could pay off big time for your health and slim down pursuit. 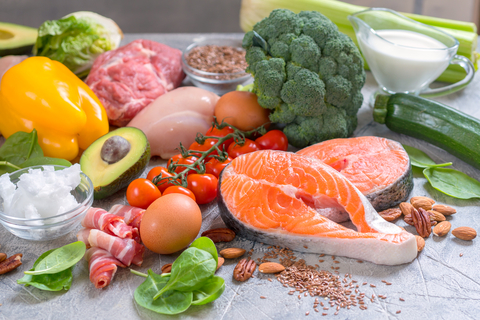 A University of Massachusetts Medical School study found that participants instructed to make one dietary change—eat more fiber—were as likely to drop pounds as those following an eating plan involving several dietary measures. Not only does fiber help keep you feeling full so you may eat less, but science suggests its ability to increase the levels of beneficial bugs in our guts as another potential way it can bolster health and improve body composition. So work at adding in some more fiber-rich foods, like whole grains, vegetables, legumes, and seeds into your “no-diet” diet. #5 Rise and Dine on Protein. Full of bread, cereals and fruits, breakfast is often dominated by carbohydrates. But a number of studies suggest that getting enough protein in the morning can play a big role in shaving off unwanted pounds. By slowing down digestion and positively impacting hunger hormones, protein does a better job at waylaying hunger than carbohydrates. The upshot is that you should make it a priority to include high-protein foods like eggs, yogurt, beans and nut butter in your breakfast routine. #6 Shuffle your Calories. Many people eat a major chunk of their calories at dinner, but it might be time to fill up at lunch instead. In a 2016 American Journal of Clinical Nutrition study, participants who ate their biggest meal of the day at lunch lost more weight during a 3-month weight loss program than those who consumed their main meal at dinner. Differences in hormone levels throughout the day could mean we burn more of the calories consumed earlier in the day than towards the evening. Insulin sensitivity may also fall as the day progresses, which could impact how the body handles calories. So consider eating a larger portion of your daily calories at breakfast and lunch and then focusing on a lighter dinner. Tags brain, breakfast, calories, coconut oil, dehydration, diet, diet tips, digestion, eating habits, fiber, fiber rich foods, food, health, high protein foods, hormone, insulin, nutrition, obesity, protein, smoothie, vegetables, whole grains, yogurt. Can Diet Help You Lower Cholesterol?